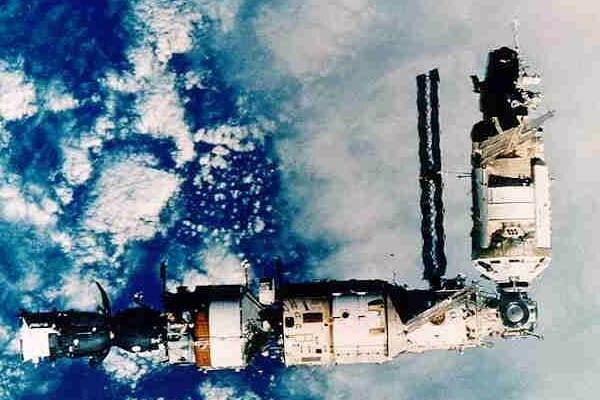 The first main module of the MIR Space Station was launched by Russia on February 19th 1986, and the initial crew, Leonid Kizim and Vladimir Solovyov, first docked with MIR on March 15th 1986. 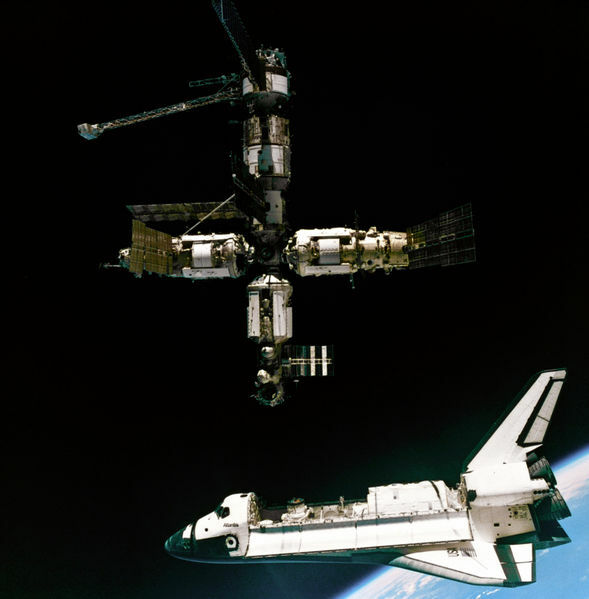 The above photo shows the Space Shuttle Atlantis alongside MIR following a supply mission. MIR was finally decommissioned and placed into an orbit which would ensure it would re-enter the earth's atmosphere. 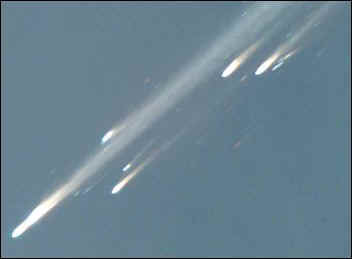 Re-entry and resulting destruction occurred on March 21st 2001. 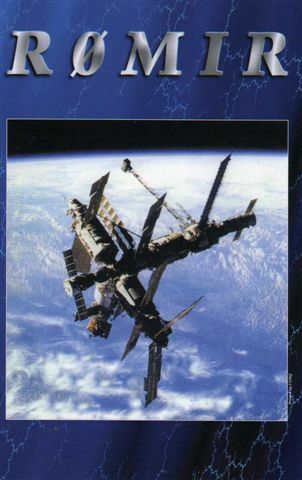 Many Cosmonauts and Astronauts are licensed Radio Amateurs, and during it's time in orbit, MIR was fitted with Amateur radio equipment. This not only included voice, but also data communications. Packet Radio, a form of computer generated data communication, had been in use by Radio Hams for some years, and an international network of 'node' repeater stations had evolved over time. With the use of a personal computer interfaced to a radio transceiver, it was possible to forward mail via an Amateur Radio bulletin board, similar to the way that email operates today. Remember, this system was in use by Hams long before the internet was developed and became popular. By connecting 'node' stations together, a Radio Ham could have a live keyboard chat with a suitably equipped Ham elsewhere on the globe. At the time, I had developed an interest in packet radio, and had installed a packet station here at GW7ERI. As MIR was also carrying this equipment, it seemed both logical and fun to try an experiment, and see whether I could connect my station to MIR. Equipment for the contact consisted of a Kenwood TH-205E hand held transmitter /receiver, which gave 5 watts of output power in FM mode. This was connected to a two meter amateur band (144-146Mhz) vertical co-linear antenna mounted about 20 feet above the ground. The computer to radio interface was achieved with a Kantronics KAM TNC (Terminal Node Controller) radio modem. The computer in use at the time was a home built 80386 type. A second computer running satellite tracking software was used to track MIR and it's progress overhead. The tracking software was also able to predict a suitable high elevation overhead pass. Using this equipment, I was unable to compensate for Doppler frequency shift, therefore it was important that an overhead orbit at the highest elevation was used. This contact would be short! At the appropriate time, 'Connect' commands were issued to the KAM TNC to connect to R0MIR, which was the call sign used by MIR. 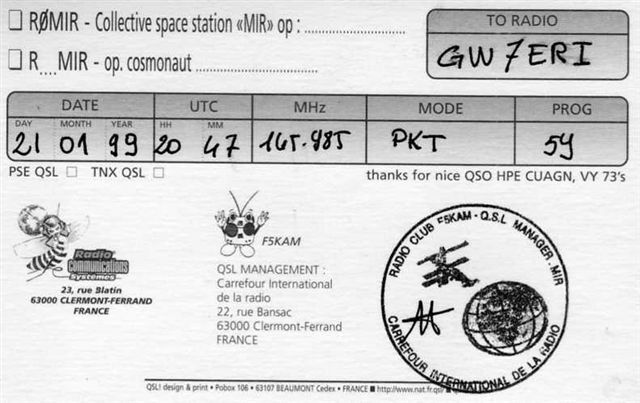 At 2047 UTC on January 21st 1999 I was delighted to receive the text back on my computer screen confirming my equipment had successfully connected to MIR on board computers. I went on to make further contacts, but two years later saw the demise of MIR. 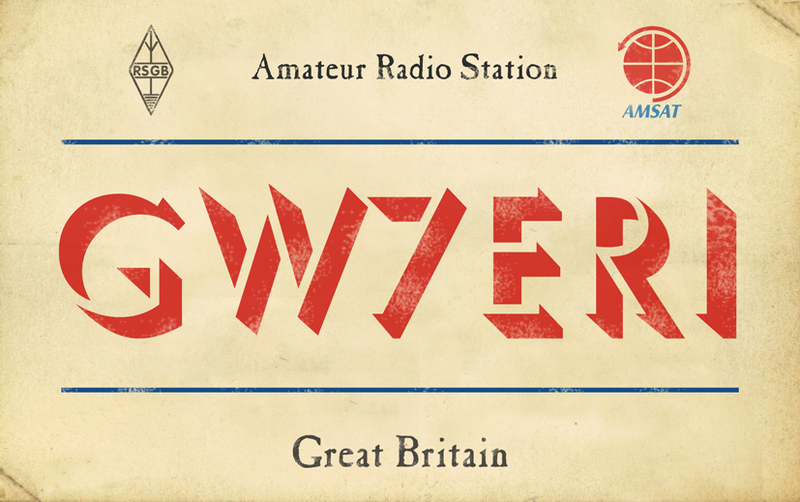 The QSL card confirming my initial contact is shown below, and demonstrates what can be achieved using relatively simple equipment. The KAM is still in use in my radio shack today, and runs the local RF APRS transmissions.